One of the classic horror anthologies, Creepshow is the gloriously ghoulish collection of comic book tales served up by the masters of macabre Stephen King and George A.Romero. It finally makes its much-anticipated UK Blu-ray debut thanks to Second Sight Films, who have been doing a storming job with Blu-ray releases of past favourites of late. Creepshow is a classic slice of EC comic inspired horror from 1982 features an all-star cast that includes Ted Danson, Leslie Neilsen, Ed Harris, Hal Holbrook, Adrienne Barbeau, Fritz Weaver, E.G. Marshall and – yes – Stephen King himself, and gets the high-definition treatment, along with a some outstanding special features. 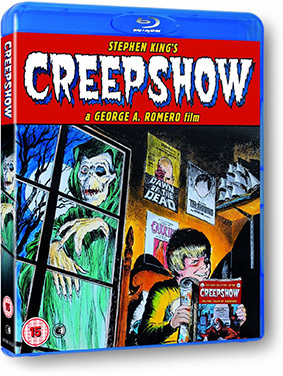 Creepshow will be released on UK Blu-ray on 28th October 2013 by Second Sight at the RRP of £19.99.